Some of our merry band – the Alpha women anyway. As for the men, Peter is taking the photo, and Syko is lurking behind the girls I think, and the other David has wandered away hoping for a pic of the elusive Rose Robin. 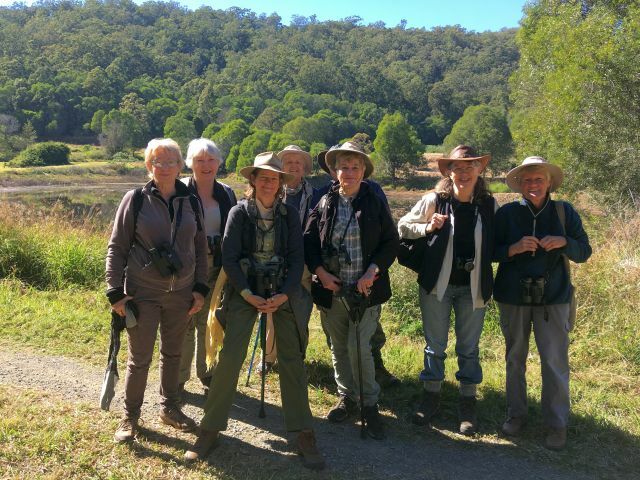 Ten of us, including David Neradil’s neighbour Peter, set off in glorious weather for the monthly bird adventure on August 9, this time to the Lower Beechmont Reserve at Clagiraba. As we drove along the spine of Tamborine the mountains to the west stood out dusky blue against the more vivid blue of the winter sky. When we turned east to descend Henri Robert Drive the ocean ahead of us glittered like a vast silvery-blue mirror. Just a perfect day to go birdwatching! Though even at 7.30, where we reached our stop at Clagiraba Creek, it was COLD! Down to seven degrees Celsius and the ground covered with a light frost. So we stayed only long enough to pick up a few brave birds before driving the short distance to the reserve entrance. Here we met Gold Coast birdo Shirley who had arranged to join us. The silent trees soon offered us a few peeps and tweets and as the sun penetrated the canopy we soon found ourselves surrounded by Yellow Robins, Scarlet Honeyeaters and Brown and Striated Thornbills. This was one of those expeditions where everyone in the group contributed to bird identification and soon the list began to grow. Including a pair of Wedge-tailed Eagles which flew majestically and rather scornfully from their roost with several Sulphur-crested Cockatoos screeching in alarm. It was a relief to get out of the trees and into the sunlit open area around the small lake. Here we stopped for smoko and watched a White-faced Heron gracefully fishing around the edge of the water and an Azure Kingfisher obligingly flyin low from one perch to another so we could get good photos of it. While some of us munched our snacks, David Neradil went off and found the much-desired Rose Robin. And David Sykes then hunted for the next part of the track, resulting in a scramble through the forest and across the creek with Julie muttering all the while that she was SURE there was a better track further along. As indeed there proved to be, and in future we’ll know where it is. There are several old and new well-marked tracks in the reserve today and they deserve further exploration. We followed the creek back down to join the main track and Kylie found a nesting Striated Pardalote while Shirley spotted White-throated Honeyeaters bathing in a rock pool. A lot of birds were obviously taking advantage of the overall warm late-winter conditions to start their spring nesting; we found (and photographed) a lovely little Eastern Yellow Robin’s nest and other birds we saw ad heard were obviously in mating mood. For once we kept to our schedule of a half day only and were home by noon, with a nice round number on the list of 50 birds for the morning – not bad for a leisurely five or so kilometre meander through a small area of limited habitat variation. 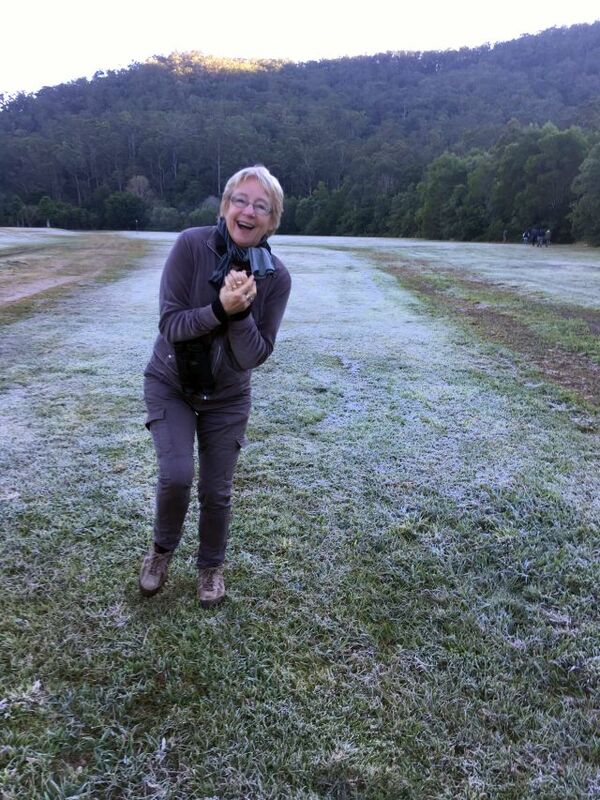 Our first stop by Clagiraba Creek and with all that frost on the ground a shivering Jan is begging for us to move on!